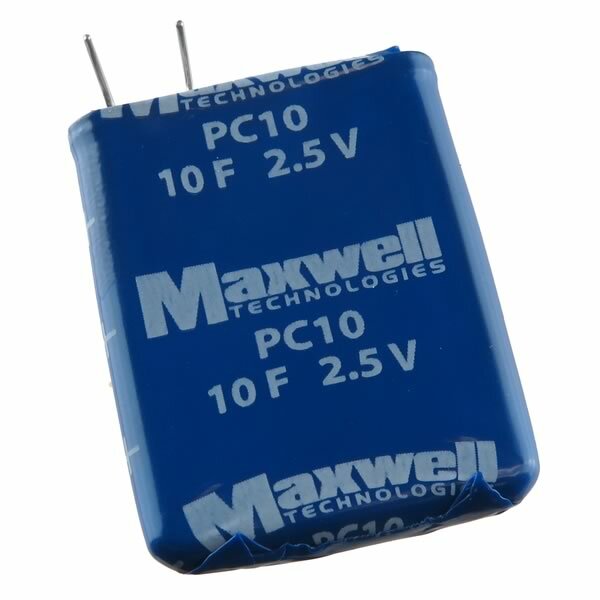 Powerful Maxwell PC10 10 Farad 2.5VDC supercapacitor. Size: 1.20" long x 0.92" wide x 0.145" thick. Maximum current is 2.80A. Maximum temperature of 70°C. Maximum ESR of 180mOhm. Features: Up to 500,000 duty cycles with 10 year life capability. Hermetically sealed, stainless steel construction. Low profile prismatic design. Higher energy vs electrolytic capacitor and higher power vs batteries. Has 2 wire leads. Brand new.